by Jim Loew Several years ago, a seed was planted in Riverwest – the seed of an idea for a community garden as part of the revitalization of the Reservoir at Kilbourn Park. This spring that seed began to sprout. There are many people determined to see that this seedling has all it needs to survive – people like Kris Peterka and Andrea Kurth of the Riverwest Health Initiative; Janice Christensen of the YMCA Community Development Center; Tom Schneider, Executive Director of COA Youth and Family Centers; members of the Kilbourn Park planning group and many, many others. “I’ve referred to it as a Victory Garden,” Christensen explained, “although I expect that the name and all the other details will be finalized by a planning group that we hope will form after the first organizational meeting” which is set for Saturday, March 28. Why a Victory Garden? It’s a concept that’s decades old. Victory Gardens were advocated by Eleanor Roosevelt during World War II when commercially canned foods were rationed. It’s estimated that there were 20,000,000 gardens at the peak of the project, and they produced 40% of all vegetables consumed in the US. 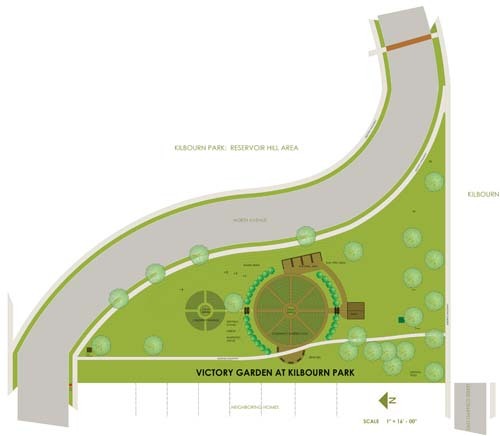 On a triangular parcel of land in Kilbourn Park – across North Avenue from the Reservoir, bounded on the west by a row of houses that front Booth Street and on the south by the sidewalk that marks where Garfield Avenue used to be – the first phase of Riverwest’s own Victory Garden is set to begin on April 18, which also marks the thirty-first annual Riverwest Earth Day Clean Up. The intention of the Victory Garden is to help people have victory over hunger, which, unfortunately, is all too real in Riverwest and nearby neighborhoods. According to a neighborhood survey conducted by the Riverwest Health Initiative, 21 percent reported they skipped meals because they couldn’t afford food. By offering a place to grow their own fruits and vegetables, these gardens can make a real difference in the health and well-being of our community. The part of the land planned to be used for the Victory Garden is approximately 300 feet long by 80 feet wide. Planners estimate that there would be enough room for about 135 eight-feet long by four-feet wide raised-bed gardens with fourfoot paths running between them for maneuverability. A bed of that size can supply enough produce for one to two adults. The Water Works Department of the City of Milwaukee owns the land where the garden is planned. Once the decision was made to decommission the reservoir on North Avenue around 2002, a community-wide planning process took place on how best to use the land. The community park you see now that opened in the fall of 2008 is the result of those meetings. . In the fall of 2008, Water Works Executive Director Carrie Lewis began talks with Tom Schneider, Executive Director of COA about the notion of the triangular parcel of land becoming some sort of community garden. Schneider was open to the idea, so he brought Janice Christensen into the project due to her work as a community organizer for the YMCA and as a member of Social Solutions for Milwaukee, a coalition of professionals in the areas of organizing, community gardens, local food issues, urban agriculture, nutrition and community health. Kris Peterka also came on board, bringing the resources of the Riverwest Health Initiative to the project as well. As of February 2009, an agreement was reached with Water Works and the Milwaukee Department of Public Works for a year-to-year contract for the Victory Garden project. At this point, the planning group is soliciting consideration and support for the gardens. Local schools, youth groups, and food pantries have already expressed interest in participating, but the main desire is for people in the community to comprise most of the Victory Gardens. To get involved or learn more, contact Andrea Kurth or Kris Peterka at 414.263.8383, Ext. 136, or Jan Christensen at 414.430.4795.